After a day of baking cookies, the last thing I felt like doing was cooking dinner. Another reason why I love my Crock Pot so much. I was able to prep this meal in the morning and let it cook all day on low and dinner is served! A simple and delicious dinner for busy weekends! Place roast in bottom of crock pot. Whisk together remaining ingredients and pour over roast. Cover and cook on low for 8-9 hours or until meat is falling apart. Spoon into rolls or bakery bread of your choice and serve with juice for dipping. Enjoy! Mmm, these must be fabulous! Love that you added some balsamic and honey. Thanks for sharing at Simple Supper Tuesday. These looks really good. 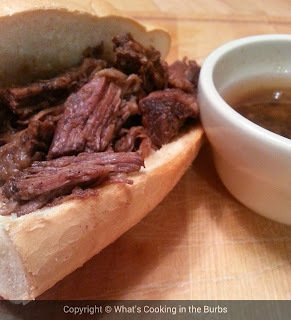 My husband loves French Dip Sandwiches and I love cooking in the crock pot! As one of the co-hosts of Tasty Tuesday's, I'm featuring your recipe tomorrow on my site Detours in Life. Stop by and grab a button when you get a chance! Thank you for linking up!